Since 1880 Steiff have been at the forefront for teddy bears and animals. Founded by Margarete Steiff, her famous saying "For our children, only the best is good enough" remains as important today, as it did over a hundred years ago. We offer the entire range of Steiff bears, animals and gifts for baby, children and adult collectors worldwide. The Steiff Spring 2019 Releases are listed here and available to order now. The 2018 Steiff Autumn Winter releases are all listed here. Some items have already arrived! The entire range of Classic edition Steiff bears. See the full range of white tag Limited Edition Steiff bears and collectable pieces. In this section we have a range of Steiff Miniature Teddy bears and Animals, with some having the added benefit of being a necklace, Keyring or Pendant. These Assorted Keyrings and Pendants are ideal for gifts and collectors. There is always room for one more, of these little friends! See the entire range of childrens teddy bears and animals by Steiff. 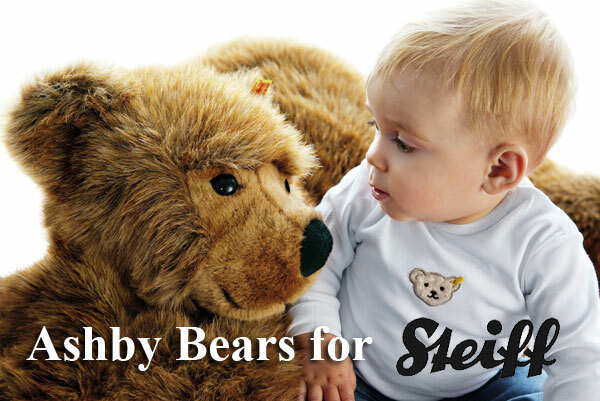 View the range of baby safe teddy bears and animals with the quality of the Steiff name. The full range of Steiff animals, domestic, wild animals, fish and birds! Check out these amazing pieces, featuring solid beech wooden rockers for quality and durability. A wonderful gift for the birth of a child or the celebration of a marriage. Steiff Personalised Teddy Bears presented by Ashby Bears. Mickey and Minney Mouse, the Snowman, the Snow dog, Wizard of Oz characters the Scarecrow, the Wicked Witch of the west and the Cowardly Lion, Sooty, Rupert and all of their friends. Beartrix Potter characters. Check them all out here! A favourite in everybody's eyes, these classic Panda Bears are hugely popular. We are a Steiff Club Store, so you can join the Steiff club here! See the Steiff club membership information here and view the special members only Steiff editions! Meet the new kids in town from the proudest name in plush, the Soft Cuddly Friends by Steiff. Steiff catalogue's and history reference books, all available to purchase! Check out the Steiff packaging and Gift Bags! Ashby Bears Steiff Event Information! Confused about the different coloured ear tags? Get the answers here! History information about this amazing company founded by Margarete Steiff! Steiff safety standards are second to none. Read the full Steiff Purity Law.